Winter solstice has been celebrated all over the world for thousands of years. It occurs on the shortest day and longest night. Although this is often the first day of winter, it also promises the return of the sun after an extended period of darkness. 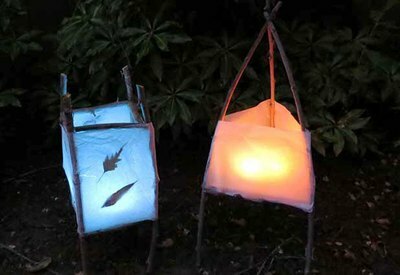 By using yard clippings and a few simple tools, you can create a nature inspired lantern to glow through the night. 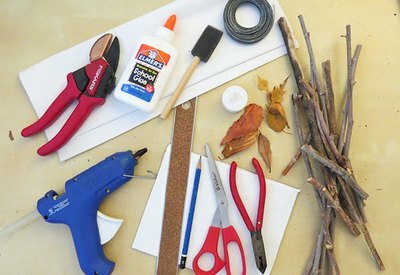 Supplies: twigs, white tissue paper, cardboard, leaves or pine needles, flameless tea light candle, wire, white glue, hot glue, ruler, pencil, scissors, foam brush, garden clippers, wire cutters. 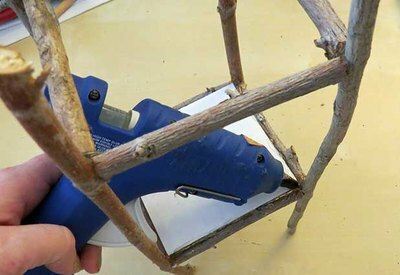 The structure of this lantern is made from twigs and leaves, making it a great project for your fall cleanup. You can create any shape you like and the possibilities are endless. 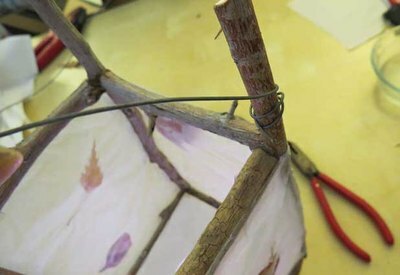 For this square lantern, cut four 12” twigs and eight 4” twigs. 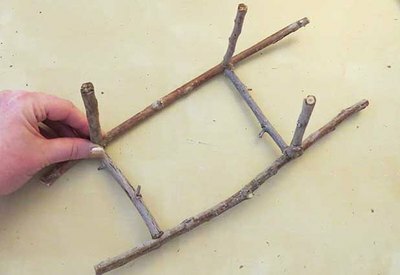 The straighter the twigs are, the easier it will be to glue together. 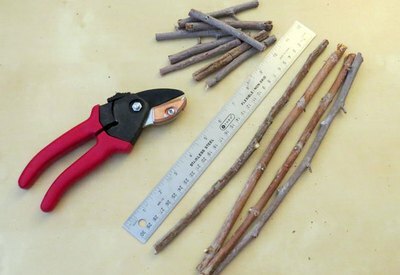 Using the hot glue gun, apply glue to one end of the 4” twig and secure it to the 12” twig a couple inches from the top. Repeat this with another 4” twig near the bottom. Once it’s dry, glue a 12” twig to the other side. Almost like a ladder. Repeat this entire process so you have two ladders. 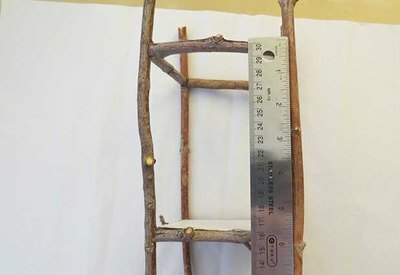 Lay the first ladder flat and hot glue a 4” twig to each corner. They should stand straight up so hold it in place until the glue is secure. Hot glue the second ladder on top of the first ladder, making it a box. Stand the structure up. If it’s unbalanced, trim the legs to make them even. Cut a 4” square piece of cardboard and glue it on top of the first shelf with hot glue. This will be the base for the candle. 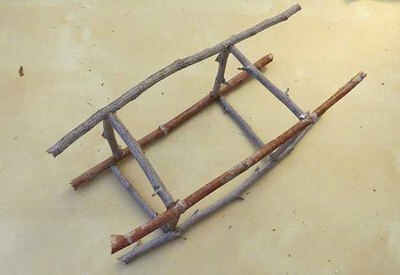 Now lay the structure on one side and measure from the top of the first horizontal twig to the bottom of the second horizontal twig. Use this measurement to cut strips of white tissue paper. For this tutorial, the measurement is 6”. It’s best to stack a few pieces of tissue paper together and cut lengthwise. 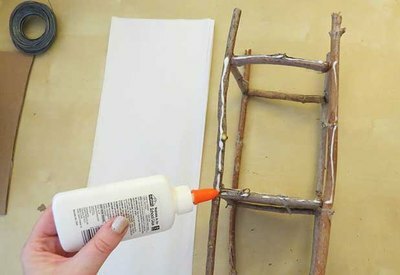 Apply a thin line of white glue around the top of the twig structure. 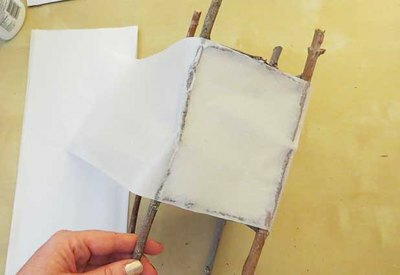 Lay the tissue paper on top of the glue and start wrapping the tissue paper strip around the structure. Apply glue to each side as you turn it. Depending on the length of the tissue paper, you may need multiple strips. Just make sure to only have one layer on each side. 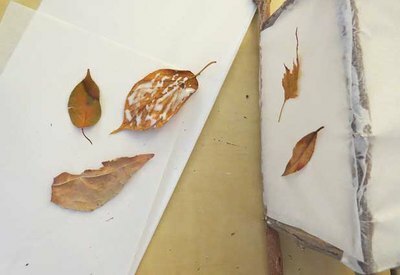 By using leaves or pine needles, you can make your lantern unique. 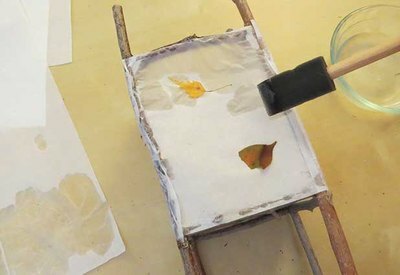 Apply white glue on the back of each leaf and secure them to the outside of the tissue paper. Just be careful not to push hard. You don’t want the tissue paper to break. 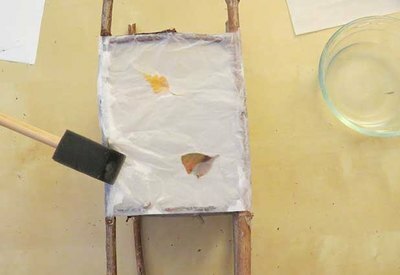 Once the glue is dry, use a foam brush and water to dampen the tissue paper. Again, be careful not to break through. It just needs to be wet enough for another layer of tissue of paper to stick. Place a second layer of tissue paper on top of the wet tissue. Wrap it around just like the first time. Except instead of glue, just use the foam brush and water. This will secure the leaves inside. Cut a piece of 20” wire and wrap one end around the top corner twig. Then wrap the other end around the opposite twig, making a handle . Now you can carry it around or hang it for decoration. Now you’re ready to light your lantern and celebrate winter solstice. For safety reasons, it’s best to use a flameless tea light candle. You can find them at most craft stores and they come in many shapes and colors.